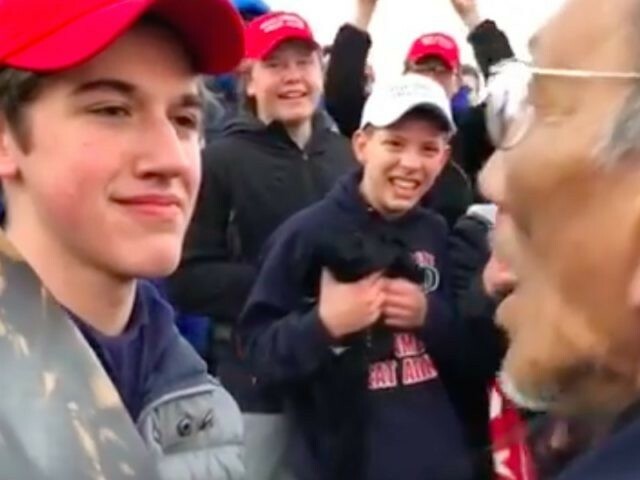 Supporters of Covington Catholic High School — the Covington, Kentucky, institution at the center of a fake news story falsely suggesting that students from the school had harassed a Native American at the March for Life in Washington, DC, last Friday — are pushing back against a claim that students from the school have worn blackface in the past. Similarly, the left-leaning New York Daily News published an article Monday about the “blackface” claim. The article began, however, not by reporting the “news” about the “blackface” claim, but by taunting Covington Catholic High School junior Nick Sandmann, who had issued a statement Sunday defending the students’ actions and denying that they had said or done anything racist. While the photo’s origins couldn’t be verified, the official Covington Catholic High School YouTube account published a video last January boasting its basketball school spirit, and several clips, including one from 2012, which showcase attendees chanting in black face, a mockery of the opposing players. The school took down the video later on Monday. In response to the “blackface” allegations, several people claiming to be Covington alumni pushed back on social media.